On the morning of 8 December 1980, photographer Annie Leibovitz went to Ono and Lennon’s apartment to do a photo shoot for Rolling Stone. She had promised Lennon a photo with Ono would make the cover, but initially tried to get a picture with just Lennon alone. Leibovitz recalled that “nobody wanted Ono on the cover”. Lennon insisted that both he and his wife be on the cover, and after taking the pictures, Leibovitz left their apartment. After the photo shoot, Lennon gave what would be his last interview to San Francisco DJ Dave Sholin for a music show on the RKO Radio Network. At 5:00 pm, Lennon and Ono left their apartment to mix the track “Walking on Thin Ice”. As Lennon and Ono walked to their limousine, they were approached by several people seeking autographs, among them, Mark David Chapman. 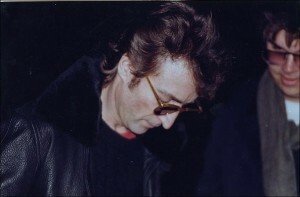 It was common for fans to wait outside the Dakota to meet Lennon and get his autograph. Chapman, a 25-year-old security guard from Honolulu, Hawaii, had first come to New York to murder Lennon in October (before the release of Double Fantasy) but changed his mind and returned home. Chapman silently handed Lenn on a copy of Double Fantasy, and Lennon obliged with an autograph. After signing the album, Lennon politely asked him, “Is this all you want?” Chapman smiled and nodded in agreement. You can see here the picture, including both Lennon and Chapman. The Lennons spent several hours at Record Plant before returning to the Dakota at approximately 10:49 pm. Lennon decided against dining out so he could be home in time to say goodnight to five-year-old son Sean before he went to sleep. Jose Perdomo, the Dakota’s doorman, and a nearby cab driver saw Chapman standing in the shadows by the archway. Ono walked ahead of Lennon and into the reception area. As Lennon passed by, he looked at Chapman briefly and continued on his way. Within seconds, Chapman took aim directly at the center of Lennon’s back and fired five hollow-point bullets at him. The first bullet missed, passing over Lennon’s head and hitting a window of the Dakota building. However, two of the bullets struck Lennon in the left side of his back, and two penetrated his left shoulder. Three of the four bullets passed completely through and exited the front of Lennon’s body, resulting in a total of seven gunshot wounds. Concierge Jay Hastings first started to attempt to make a tourniquet; but upon realizing the severity of his injuries, simply covered Lennon with his uniform’s jacket, removed his blood-covered glasses, and summoned the police. The first policemen to arrive were Steve Spiro and Peter Cullen, who were at 72nd Street and Broadway when they heard a report of shots fired at the Dakota. The officers found Chapman sitting “very calmly” on the sidewalk. They reported that Chapman had dropped the revolver to the ground, and was holding a paperback book, J.D. Salinger’s The Catcher in the Rye. Chapman had scribbled a message on the book’s inside front cover: “To Holden Caulfield. From Holden Caulfield. This is my statement.” He would later claim that his life mirrored that of Holden Caulfield, the protagonist of the book. The policemen immediately carried Lennon into their squad car and rushed him to Roosevelt Hospital. Officer Moran said they placed Lennon on the back seat. Moran asked, “Do you know who you are?” There are conflicting accounts on what happened next. In one account, Lennon nodded slightly and tried to speak, but could only manage to make a gurgling sound, and lost consciousness shortly thereafter. Very good blog post. I certainly apopreciate this site. Thanks so much! If you are interested in this topic, you can find other related articles on my website.